This group of bracelets shows all three of the thicker style bracelets that I make. They have a nice clean straight line with a beautiful hammered surface. 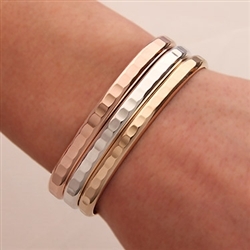 The three metals compliment each other so well, and combine to make a beautiful statement piece. The bracelets can also be worn individually, or in any other arangement.